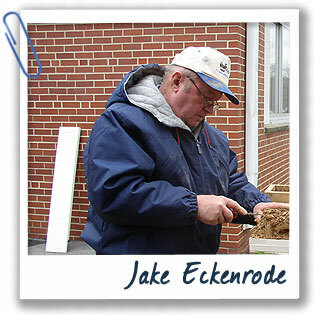 Over his 39-year career with the USDA, Jake Eckenrode dug holes all over Pennsylvania to examine soils and make soil maps. How did you get interested in soil? I’m retired now, but I started playing in soil at home on our dairy farm. Even back then, I realized that if you don’t have soil, you don’t have life. It’s kind of basic. It’s crucial. Civilizations depend on soil! They exist and die because of it. Now that you’re retired are you still involved with soil? I have 20 acres and I play in the soil. Yes! I love it! I love it! I continue to do a lot of educational projects with kids, too. We make mini soil profiles. The kids love it. My basement is full of soil. My wife doesn’t appreciate it, but it’s there. I have soil samples I’ve collected from Alaska, Puerto Rico, and Pennsylvania. I have hundreds of half-scale soil monoliths that I’ve made with school kids.